P. A. Curtis - chiropodist / podiatrist in Watford - what we see. P. A. Curtis, D.Pod.M., M.C.Pod. While understandable, this fear is almost always unfounded. Just as not every runner can win an Olympic gold medal so not every foot problem can be the worst in the world. Most of us are destined to sit somewhere in the middle - even our afflictions are doomed to be average! An ingrown toenail (onychocryptosis) has a history of being something of a Music Hall joke. This is fine until one has to experience the joke oneself... suddenly it isn't quite so funny! 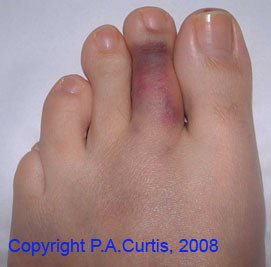 If one is unfortunate then both sides of a toe may be affected - even less humorous! Should the side of the nail become sore, swollen, inflamed or start to discharge then the more quickly it is attended to then the greater the chance of a rapid and simple resolution. There are a variety of ways of treating an ingrown nail. This shows the end result of one, known as Zadik's technique. Fortunately there are a range of alternative methods available. We don't use this technique at all. An ingrown nail most commonly affects the first toe but it may, on occasion, affect any of the others. Apart from the obvious cosmetic problem, Zadik's operation tends to be rather uncomfortable post-operatively. This combination tends to put people off seeking treatment for further problems until they have been in pain for quite some time. It is an unnecessary fear since modern methods are virtually painless and cosmetically very good indeed. The nail of the first toe shown on the left had been extremely curved, similar to the picture below. For decades it had caused almost constant pain, interspersed by recurrent bouts of infection. Both sides of the nail were removed and prevented from growing back. 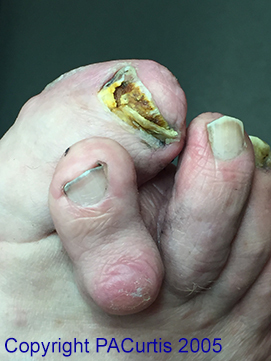 The patient, now in her seventies, was so pleased with the result that she subsequently elected to have the same procedure carried out on the other foot. Many people who complain of an ingrown nail actually suffer from involution - the border of one or both sides is curved to excess. The curvature wouldn't normally be as obvious as shown in this picture. An ingrown nail can easily develop from this due to injudicious cutting away at the sides trying to relieve the discomfort. Bunions can have a variety of names (hallux valgus / hallux abducto valgus / hallux abductus...), all trying to describe the precise deformity of the great toe. They can present in various forms and to varying degrees. They have more then one cause and more than one treatment option exists. 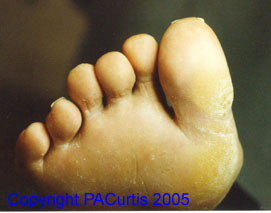 Each great toe (hallux) contains two bones (phalanges); each of the lesser toes contains three. The broken toe may be taped to its neighbour but generally, as long as there is no displacement, this kind of injury can be left to heal on its own. 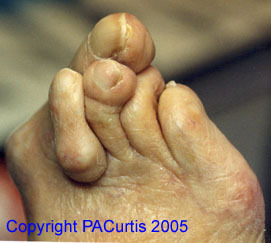 Webbed toes (syndactylism) is more common than one might think. It can also occur in the hands. Very little problem results, other than flip-flops perhaps being a little difficult at the beach! Extra toes (polydactylism) are not too commonly seen in adults in this country since the extra digits are normally removed at birth. 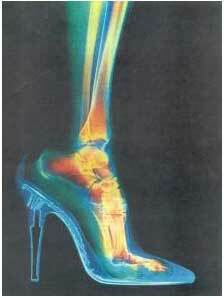 The increased width of the forefoot can seriously restrict the choice of footwear, particularly for ladies. 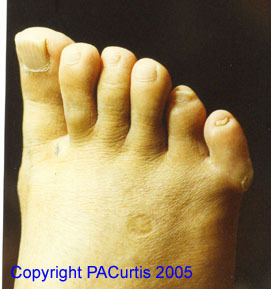 Short toes (microdactylism) are not overly common. In the case shown it is not actually the toe that is short, it is the 4th. metatarsal. As and when the condition does occur then the fourth met is the most likely site. As can be seen from the plantar view, the lack of a significant metatarsal has resulted in the foot "folding" slightly - there has been no surgical intervention and there is no scar, as might be inferred from the picture. At the time of these photographs this lady was in her early eighties and remained active, having suffered virtually no inconvienience from her condition other from having to have been careful with her choice of footwear. The condition may be associated with Rett syndrome - an unusual neurological condition usually found in girls and affecting 1 in 10,000 female births. Raynaud's phenomenon occurs when the blood vessels supplying a digit temporarily restrict the flow of blood. It is most frequently seen in the hands but can also affect the feet. It is five times more common in women than men. When seen in men it may well be associated with an occupational factor - e.g. "vibration white finger". If the tissue that forms a nail is damaged then the nail formed by that tissue will also be damaged, to a varying degree. This condition has numerous names, e.g. "Ram's Horn Nail" and "Ostler's Nail" (named after the ostlers - the people who used to look after horses and who used to have their toes trodden on by heavy, equine feet). 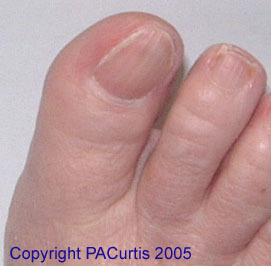 The nail may just be a little thickened - onychauxis - or severely thickened and deformed - onychogryphosis. 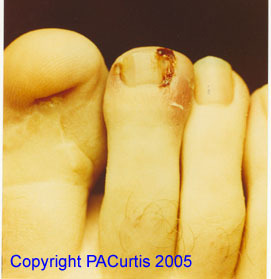 The first toe is most commonly affected but any nail may, on occasion, be damaged in this way. The nail can easily be painlessly thinned. In certain cases it may need to be removed, but this is unusual. The condition shouldn't be ignored. If the nail is allowed to overgrow then, quite apart from the discomfort, the tissue below may start to deteriorate. 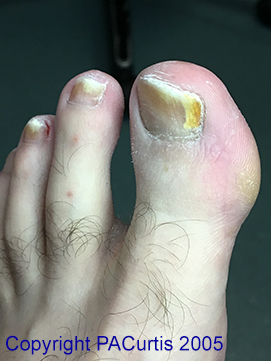 Fungal nail infections may be caused by yeasts or moulds, but are most frequently caused by a class of fungi called dermatophytes. The most commonly occurring of these is Trichophyton rubrum. The infection usually starts at the free edge of the nail and then moves towards both the centre and the base of the nail, at varying speeds. 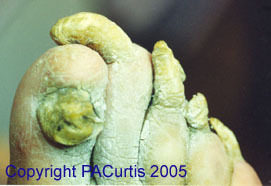 Treatment is a challenge because the fungus is shielded by the nail plate. The earlier that treatment is started the greater the chance of a positive outcome. 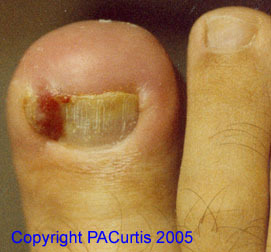 If the problem is ignored then the fungus will tend to cause increasing damage to the nail plate. This damage may become irreparable, given enough time. 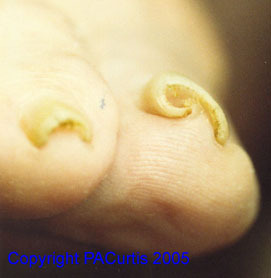 Treatment becomes much more difficult once the fungus has penetrated underneath the cuticle. This looks like a fun night out! Health & Care Professions Council.